A Hippitty Hoppitty Happy Easter Basket! I wanted to show you more detailed photo's of my Easter Basket, that was recently published in Create and Decorate Magazine! The wooden basket was perfect for this project, so I dressed it up to make the perfect Easter Basket. Graphic 45 Once Upon A Springtime patterned paper helped create the perfect vintage theme. Waltzing Mouse has some wonderful vintage themed stamps. I used the Rescue Remedies stamp set. It matches perfect with Spellbinders Labels Four die templates. The edges of the tag were distressed, then the entire tag was misted with Tattered Angels Copper Glimmer Mist for an aged look. The Labels Twenty-Two die template was placed over the patterned paper and aligned around the Bunny Image. I cut/ebmossed Labels Twenty-Two and also created a mat behind the Bunnies using the next size larger die template. The edges of each Label were inked for an added vintage feel. I cut/ebmossed Rose Creations, curled the edges, layered and inked. The scallop die cut border around my Easter Basket was created with Spellbinders Classic Scalloped Edgeabilities. Wood is one of my favorite mediums to use mist on. I chose Tattered Angels Copper Glimmer Mist to mist my Easter Basket. I misted several layers, and allowed each layer to dry before applying the next layer. The beauty of misting on wood, is that the glimmer mist almost floats on top of the wood and creates an amazing look. Plastic Easter eggs were used as the base for my collaged eggs. I tore old book pages then dipped them in mod podge and layered them onto the eggs. Air bubbles were smoothed out, and the eggs were allowed to dry on a non-stick craft sheet. When they were dry I misted with Tattered Angels Copper Glimmer Mist. They turned out so lovely. They were so much fun to make! My girls even joined in the fun. I hope you have enjoyed taking a closer look at my Easter Basket. Thank you so much for stopping by my blog today! ps- the winner of the Wings of Hope die templates and t-shirts was Toni from Oregon!!! Thanks to all of you who played along. I'll have more blog candy in the near future. I wish you all a very Happy Easter! Have you ever seen Beacon Adhesives - The Glueologist video's? He's a pretty funny guy and is full of personality. He was kind enough to ask me to do a video demonstrating Spellbinders Grand Calibur and Zip Dry adhesive at CHA Winter 2011. In the video, we show you how to use Stiffen Stuff on fabric so you can die cut fabric! I create a dimensional flower using Donna Salazar S5-050 Rose Creations, and The Glueologist - Mike Assile -shows a really cool trick with Zip Dry. I was pretty nervous at first, but he always makes you feel welcome and at ease. They had a huge camera and studio lights, and everyone passing by would stop and watch for a bit. It was a lot of fun and I learned a lot. We are always our worst critic for sure, and I see some little things I might have done differently. But, what a great learning experience for sure! Thanks for stopping by my blog today! I really appreciate your feedback and comments. Spellbinders Nestabilities Book - Guess Who's on the Cover! I am so excited!!! I created this baby ensemble for the new Spellbinders Nestabilities book and can you believe it....it's on the cover! You just never know when you submit a project for a book call, if it will get pickedup. Then to learn it's on the cover is just over the top! There are a ton of amazing projects in this 66 page book. You'll never run out of inspiration. Here's where you can buy your copy now - Annie's Attic. There are sneak peek pages on their website and you can see a preview of some of the projects in the book. You can even download the entire book in PDF form right now. 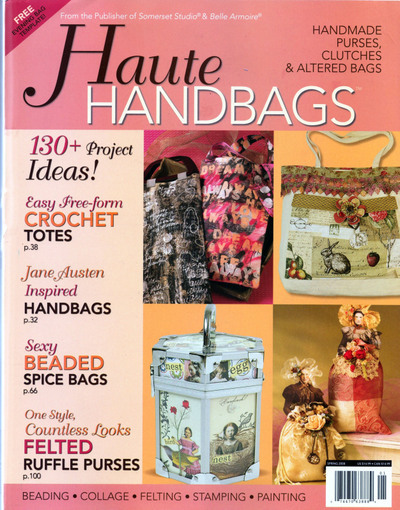 Woohoo I'm a Cover Girl! T-shirt blog candy, CHA with Spellbinders & Grand Calibur!!!! The CHA (Craft and Hobby Association) show was super fabulous! I've been to several shows with Spellbinders Paper Arts, and I must say...this one seriously ROCKED!!! I was lucky enough to be able to demo the Grand Calibur machine throughout the show. The response was amazing! Everyone loved the new machine. It's so easy to use, quiet, beautiful, and is able to take on our new HUGE die templates - called Grand Nestabilities!! WOOHOO! See that white little lever on the front of the machine? It flips to the side to allow your Grand Calibur to suction to the table! Believe me when I say that this baby isn't moving an inch while you create your projects. The Grand Calibur weighs only 7 lbs, with dimensions of L x W x H: 15½ x 8½ x 10¼". You can see the beautiful raspberry colored plastic housing, but inside this machine is steel rollers and gears. This dream machine is practically indestructible! The handle rolls really and easily, it requires minimal effort. Three plates and one embossing mat come with the machine. The plates are really large - about 8 1/4" by 12" so you can load them up with several die templates and cut them all in one pass! Talk about quick and easy Christmas cards! I am so in love with this new machine! Stacey Caron holding up those witty t-shirts. Just leave me a comment by Friday August 6th - 12pm MST on this blog post, and I'll randomly draw a name. Make sure to leave your email address in the comment form so I can contact you. Sew Somerest Magazine came out December 1st. My altered pillow "Remembering Grandma Theresa" is there! I actually made this creation over a year ago and sent it in for publication. They decided to hold it for the December 2008 issue (this special edition magazine is only published 2x per year). So, it is finally in print! I used a vintage photo of my grandma in her nurse's uniform playing "peek-a-boo". Grandma Theresa loved to garden, so I included a large sunflower. She had an old typewriter she always let us play with, so I included that image as well. She also wrote me letters almost every week when I was away at college. She loved spending quality time with us (hence the clock image), and making us feel special. She also made holidays very special for me when I was growing up. So, it's fitting that this was published this month. I sewed a cover for a pillow insert, then tied the end together with one of Grandma's dinner napkins, ribbons and Spellbinders die cut tags. I stamped on several of the tags and ribbons. The word stamp is "Memories" by Tim Holtz. I created a photo collage using Spellbinders digital fusion elements. I printed the collage onto an inkjet transfer, then it was sewn onto the pillow cover. I hope you all have a very Merry Christmas and a Happy New Year! 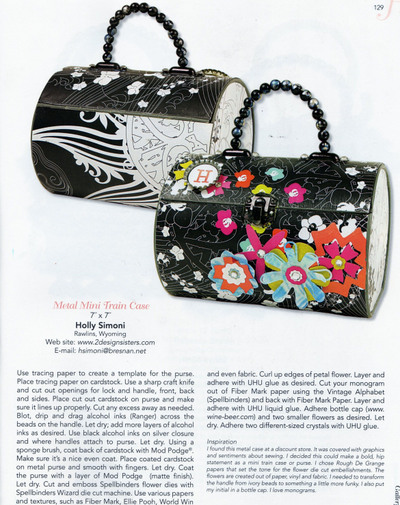 The spring 2008 edition of Haute Handbags is on shelves now and my mini metal train case is featured on page 129! I found a mini metal purse at a discount store and decided it could use a transformation. I used Rouge De Garange paper (A French paper company) for the base of the train case. It got a good coat of Mod Podge, which I used as an adhesive and a sealer. The flowers and monogram were created using Spellbinders Style Dies and the Wizard (my favorite tool in the universe), Mr Ellie Pooh paper (guess what it's made out of?!! ), vinyl papers by Fiber Mark , cardstock by World Win, and even fabric. UHU glue was used to adhere the flowers to the case. The handle and other metal objects were altered with Tim Holtz' Alcohol Inks by Ranger. It was a really fun project to make. Diana (my sister) was also featured in the magazine. Check out her creations at www.dianadellos.typepad.com.